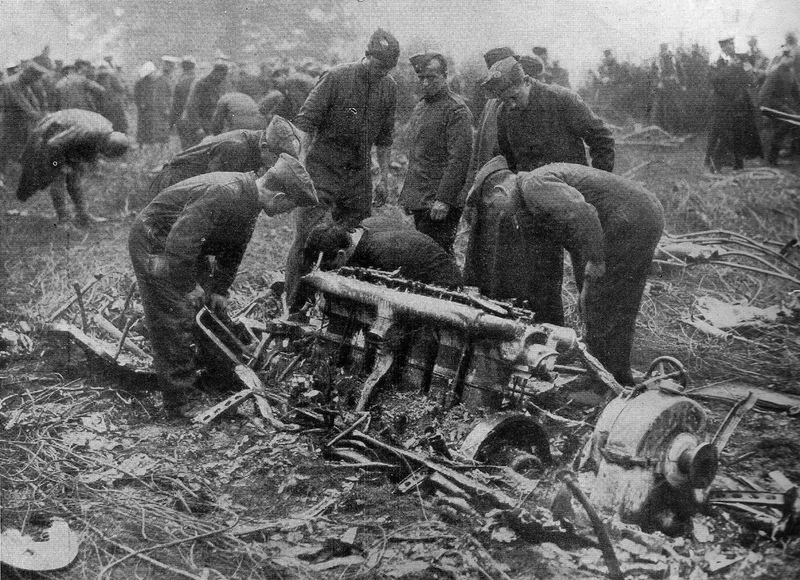 British military personnel sift through the wreckage of Airship SL11, shot down near Cuffley, Hertfordshire, on 3 September 1916. Image from Europeana. “The potentialities of the picture-theatre are truly manifold,” a writer in the Belfast Evening Telegraph contended in a lengthy article at the end of September 1916. “The cinematograph is the popular drama of the day,” s/he argued; “it arrests the eye, and is led by its avenues straight to the heart. It has touched a public which every day is growing vaster.” Although the ability of cinema to show things that could only be told about on the stage was particularly highlighted by the article’s subheading – “Shows What Theatre Only Tells” – the potentialities were widespread, ranging from the cheapness and comfort of picture-house seating, through the advantages of its complete darkness to a young man and his sweetheart, and on to cinema’s promotion of temperance among the poor. Cinema’s commercial nature and its potential for harm were also addressed, with the article concluding that “[b]eing a commercial concern […] the entrepreneurs of cinemas provide the people with what is most likely to pay, and, as in the boxing ring, where the cry is for gore, so in the cinema the authorities find it in their interests to yield to the popular clamour for sensation” (“Cinema’s Popularity”). 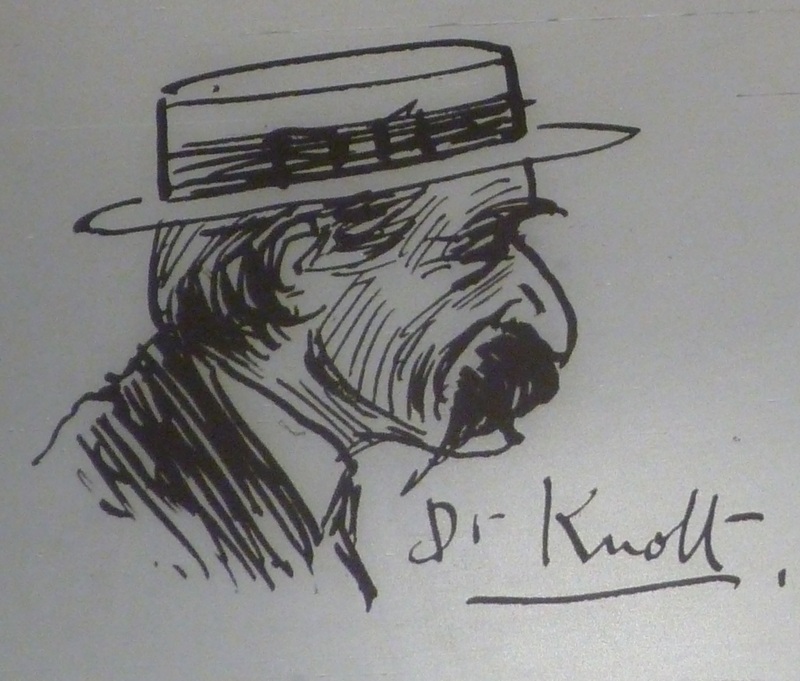 Joseph Holloway sketched film enthusiast Dr John Knott in his diary in August 1914. National Library of Ireland. In the course of a chat on the tram into Dublin city centre on 26 October 1916, architect and diarist Joseph Holloway heard from his young neighbour Jack Murray that the growing popularity of cinema over theatre had to do with the speed of the new medium. “Then he told me,” Holloway wrote, “he was mad on Movies & went at least twice a week to see them. He saw Bella Donna on the pictures & afterwards saw it at Gaiety when he found it hard to sit out,– it dragged so & was so slow.” When Holloway told Murray that several prominent Dublin citizens also had a picture-house “infatuation” – including dancing teacher Professor Maginni, authors Æ and D. J. O’Donoghue, and Dr John Knott – “he said he was pleased to be in such good company in his taste” (Holloway 26 Oct 1916: 1002). 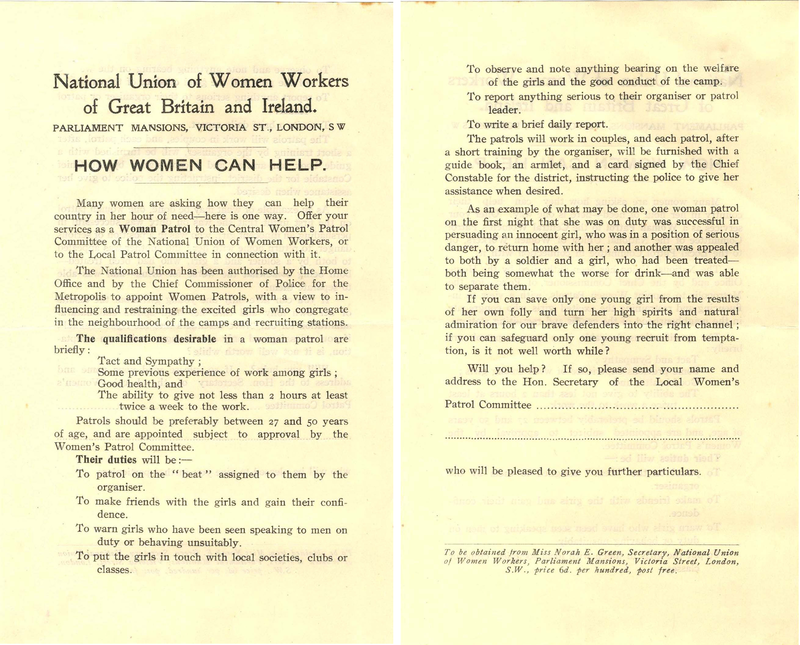 Leaflet issued by the National Union of Women Workers of Great Britain and Ireland. Available at Century Ireland. “Comedy, tragedy and melodrama,” the Telegraph writer observed on cinema’s potential for speed; “[t]he picture palace caters for the whole of these, and they pop up successively in the space of a few minutes.” Not everyone was so impressed by this potentiality. At a meeting of the Dublin branch of the National Union of Women Workers (NUWW) of Great Britain and Ireland, the Hon. Mrs. Frankland argued that “it was not good for children to see different things as quickly as they did in picture houses.” Unlike the working-class Irish Women Workers’ Union founded by Delia Larkin in 1911, the Dublin branch of the NUWW had been “formed at a Drawingroom meeting held, by invitation of Lady Wright, in November” 1915. At a subsequent meeting in June 1916, Wright was elected president of the branch, “and a resolution was passed urging the appointment of women police in Dublin, submitted by the Irish Girls’ Protection Crusade”. By the time of the October meeting, picture houses had come to the NUWW’s attention as suitable for patrols. “With regard to cinemas,” Frankland reported, “about which people were thinking a good deal, though they had their educational value, they also had possibilities for harm.” A model for activity in Dublin was provided by branches in Britain, where “[s]ome of the police authorities had asked the Union to lead some of their patrols to go round to cinemas and report on various questions, such as lighting, general control of buildings, etc.” (“Union of Women Workers”). I know one cinema house where a certain picture which claimed to be artistic, but was nothing but an appeal to the lowest human passions, was not shown after the “trial” exhibition. Cutting down and chopping was no use. The film was considered valueless without the objectionable features! The crusade against indecency in cinemas was waged with particular vigour by the Catholic Irish Vigilance Association (IVA), which in June had welcomed the appointment by Dublin Corporation’s Public Health Committee of building inspector Walter Butler and Councillor Patrick Lennon as film censors. At the same time, the IVA had criticized the delay in putting the censors to work, which required the confirmation of the whole Corporation, and this did not happen until the 2 October. On that day, a deputation of lay and clerical members of the IVA addressed the meeting. Canon Dunne urged that the wording of the Corporation’s licence be emended to ensure that the job could not be done by “a man from some other country, a man from the Continent, or a man who was connected with some of these [picture] houses.” IVA solicitor Thomas Deering appealed to the nationalism of the majority of councillors: “When the English Parliament put this power into their hands he did not see why the Council should hesitate to exercise this small measure of Home Rule” (“Censorship of Films”). This was a legitimate point, albeit with some exaggeration. However, the IVA disputed it without addressing Ryan’s argument about the sheer number of films but by merely asserting that such unimpeachable authorities as Dublin’s Archbishop, Alderman Lorcan Sherlock and the two censors themselves said it could be done (“Cinemas and Censors” 20 Oct.). Cinema’s potentialities were evident to the newspapers, who in their reporting of film censorship and other cinema-related matters in October were also positioning themselves in relation to the new medium. Most of the Catholic nationalist papers, including the Freeman’s Journal, Irish Independent and Evening Herald positioned themselves in opposition to cinema by actively supporting the campaign to introduce film censorship. A Herald editorial, for example, noted with satisfaction Home Secretary Herbert Samuel’s speech on 23 October, in which he undertook to introduce a centralized official film censorship (“Censorship of Cinemas”). Such a stance did not mean that these newspapers in any sense rejected the revenues from cinema advertising on their entertainment pages. Such ordinary business pragmatics were not to be disrupted by the introduction of film censorship. Indeed, Deering in his address to the Corporation argued that Irish picture-house owners would not be adversely affected by censorship because “there were hundreds and thousands of people in the City of Dublin who would neither go to picture houses themselves, not allow their children to go, on account of a certain class of pictures shown there (hear, hear)” (“Censorship of Films”). Dublin audiences could first experience The Diamond from the Sky serial in written form before seeing it on screen at the Masterpiece and Camden. Dublin Evening Mail 28 Sep. 1916: 8. Other papers allied themselves more closely with cinema in autumn 1916. These included the Protestant unionist Dublin Evening Mail – along with its sister papers the Daily Express and Irish Weekly Mail. “Now that ‘serials’ are the fashion in the moving picture world,” the Evening Mail observed, “it is gratifying to be able to recommend to the attention of serial readers and picture-goers the wholesome story and film to be published and exhibited in Dublin under the title of ‘The Diamond from the Sky’” (“Diamond from the Sky”). Film serials were by no means a new phenomenon; they had been showing in Ireland since November 1913. And The Diamond from the Sky was not wholly new either; it had already been shown in Irish cities and in such towns as Tralee (beginning 29 May 1916) and Cavan (beginning 10 July 1916). Serials that appeared in newspaper at the same time as they were being screened in the picture houses were also as old as 1913’s What Happened to Mary. The novelty in autumn 1916 was that the story appeared in an Irish paper rather than in a British one. 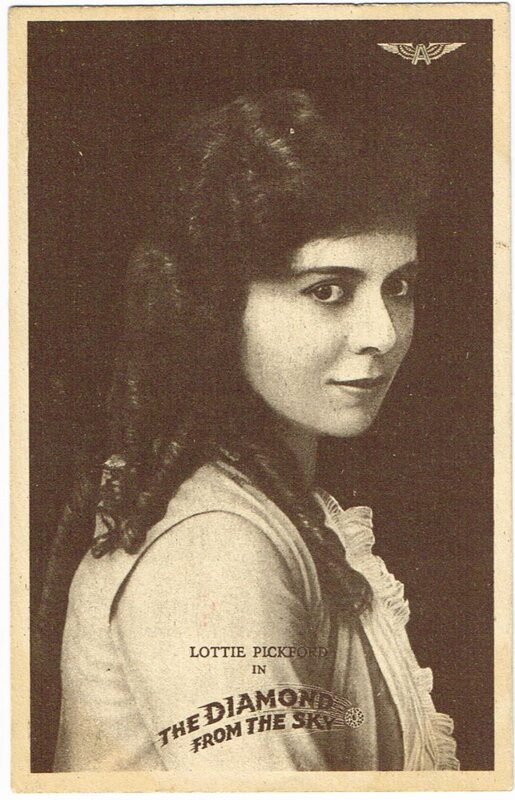 Lottie Pickford in The Diamond from the Sky (US: American, 1915). Image from Wikipedia. Beginning on 2 September 1916, the story was serialized in weekly episodes in the Irish Weekly Mail. Although “[c]rowded with sensational incidents and full of that ‘punch’ which successful films and stories must always possess,” it was “absolutely free of crude sensationalism, and anything ‘grisly’ in the nature of crime” (“Diamond from the Sky”). Starring Lottie Pickford, sister of the more famous Mary, its title referred to a diamond found in a meteor that became an heirloom of the aristocratic Stanley family, who to ensure a male blood line fatefully buy a baby boy from an unscrupulous gypsy. This wholesome subject matter first hit the screen of the Masterpiece Theatre on, Monday, 4 September to coincide with the story’s release in the previous Saturday’s Weekly Express. It was also being serialized at the same time in the Westmeath Exminer and the Mullingar Cinema Theatre (“Mullingar Cinema Theatre”). The film had a second Dublin run at the Camden Picture House beginning on 29 September, by which point the tie-in with the Express was well out of sync. Although not noted in contemporary sources, the film The Diamond from the Sky had local interest in its Carlow-born co-director William Desmond Taylor, but more obvious Irish filmmaking interest was raised by the October release of the Film Company of Ireland’s (FCOI’s) second film The Miser’s Gift (Ireland, 1916). The film premiered at Cork’s Coliseum on 12 October, ran at Tralee’s Picturedrome 19-21 October, before opening at Dublin’s Dame on 26 October 1916. 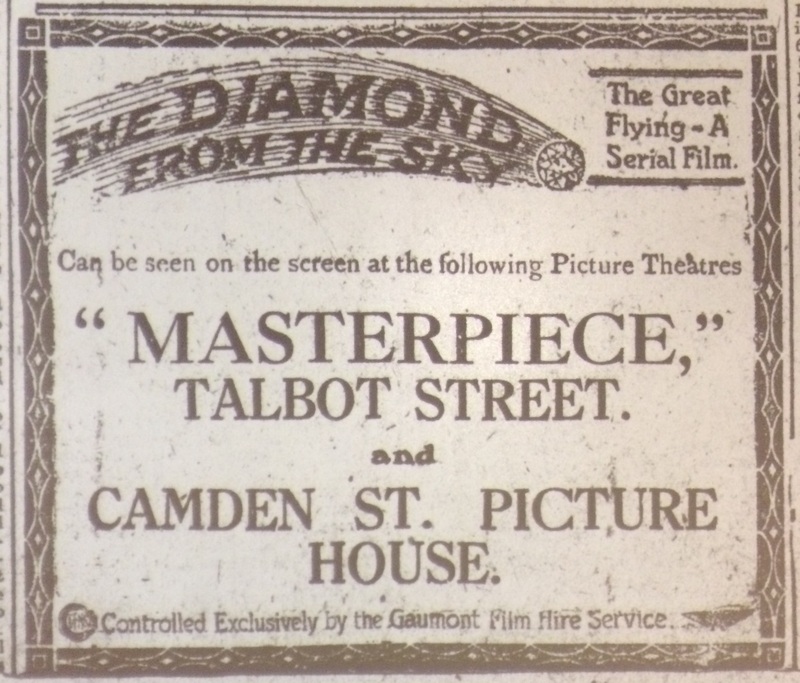 In its advertising of the film, the Dame announced that it had secured the “initial presentation of all the films produced by the Film Co.” (“Dame Street Picture House”). The FCOI’s third film, The Food of Love, would open there on 2 November. This arrangement with the Dame seems to have been part of the arrangements that FCOI made in the successful wake of their first film. At the end of September, Paddy, the Irish correspondent at the Bioscope, revealed that they had fitted out their offices at 34 Dame Street with developing rooms and advised that “[s]cenario writer could do very much worse than submit them a sample of their work” (Paddy 28 Sep.). 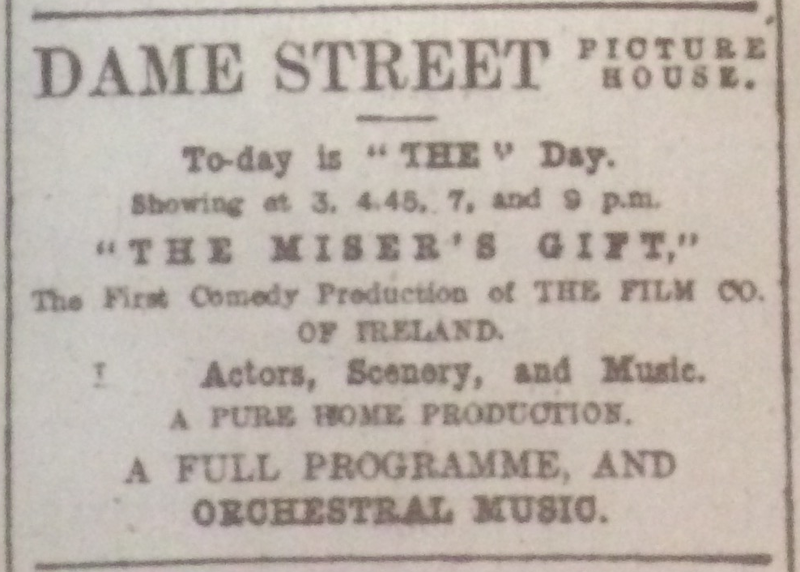 For aspiring scenario writers, the Irish Times recommended J. Farquharson’s Picture Plays and How to Write Them, which included Benedict James’s film scenario for Arthur Pinero’s The Second Mrs Tanqueray, which was on release at Rathmines’ Princess Cinema for the three days beginning Monday 23 October 1916 (“Picture Plays”). played the role of miser. It was a story of dreaming of Fairy gold three times & the miser giving as wedding gift the contents of the crock he came by owing to his dreaming. It was effective & interesting & many scenes in the fair at Killaloe etc were really delightful glimpses of country life. Others were more forceful in promoting the film’s potential to raise the general quality of cinema offerings. “I do not really think that the majority of people can be so degraded n their tastes as to prefer the rubbish trans-Atlantic films to really good pictures,” wrote HTH in a letter to the Evening Herald. S/he thought that by encouraging home produced film such as those from the FCOI, “in time, they would tend to oust numbers of inanities and vulgarities which at present fill up the programmes of nearly every cinema theatre. Such pictures would elevate the mind as well as to amuse, and they would be clean” (“Clean Amusement”). 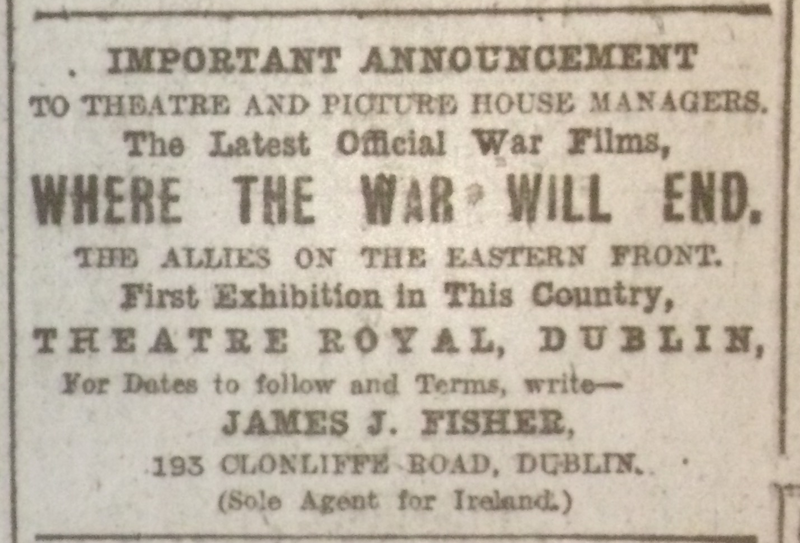 James J. Fisher was the Irish agent for the official war films; Dublin Evening Mail 31 Oct. 1916: 2. While the potential of Irish film production was just beginning to be realized, cinema’s role in wartime propaganda was quickly developing with a realization that military technology offered opportunities for the kind of spectacle that could harness the popular audience to the war effort. Newspapers that had long carried sensational stories of submarines, airships and airplanes now added accounts of such innovations as tanks – first mentioned in mid-September 1916 – and flamethrowers (“German Flame Attacks”). Artillery, tanks and flamethrowers would remain battlefield weapons, but long-range weapons that brought the war to civilian populations had a particular ideological charge that could be exploited by filmmakers. Nevertheless, the press remained the fast news medium, with newspapers offering lengthy and vivid accounts of successes against the feared airships. On the night of 1 October, an airship downed near London was reported to have been “watched by millions of eyes as it fell, lighting up earth and sky like some great celestial torch” (“Another Zeppelin”). This and other reports appeared in Irish papers on 2 October, and although by the following day, Dublin’s Picture House, Grafton Street and Masterpiece Theatre were showing a film of downed Zeppelins, it was The Wrecked Zeppelins in Essex (Britain: Gaumont/War Office, 1916), which had been filmed the previous week. Beyond their news value, however, the official war films were also popular in Ireland, following the success of The Battle of the Somme (Britain: British Topical Committee on War Films, 1916). The War Office and film companies recognized the high demand for such films, and in October, James J. Fisher – “military correspondent and author of the work entitled ‘Immortal Deeds of Our Irish Regiments’” (“Battle of the Somme”) – was appointed Irish agent for the British official war films. Fisher premiered the films at Dublin’s largest theatre, the Theatre Royal, usually with military bands providing accompaniment. Despite incidents of Republican attacks on soldiers in the streets of Dublin, several picture houses also exhibited the films. When William Kay took over management of the Rotunda Pictures on 2 October 1916, he arranged with Fisher to show the recently released French film of the battle of the Somme for the week beginning 30 October 1916. The programme included “the wonderful cartoon showing how Lieut. Robinson, V.C., brought down the Zeppelin,” the first official film from the Egyptian front, music by the band of the Royal Irish Fusiliers, and recitations by Sergeant W. H. Jones of the 5th Lancers (“An Attractive Programme,” “Platform and Stage”). These were just some of cinema’s manifold potentialities in October 1916. “An Attractive Programme.” Dublin Evening Mail 26 Oct 1916: 5. “Another Zeppelin Brought Down in Flames Near London.” Dublin Evening Mail 2 Oct 1916: 3. “Censorship of Cinemas.” Evening Herald 24 Oct. 1916: 2. “Censorship of Films: Deputation to the Corporation.” Freeman’s Journal 3 Oct. 1916: 2. “Cinema Films: Corporation and Question of Censoring.” Evening Herald 9 Oct. 1916: 2. “Cinemas and Censors.” Letters. Evening Herald 17 Oct. 1916: 2; 20 Oct. 1916: 2. “Cinema’s Popularity: Manifold Potentialities: Shows What Theatre Only Tells.” Belfast Evening Telegraph 29 Sep. 1916: 4. “Clean Amusement: Chance for Good Irish Films.” Evening Herald 23 Oct. 1916: 3. “Dame Street Picture House.” Dublin Evening Mail 24 Oct. 1916: 4. “Diamond from the Sky.” Dublin Evening Mail 30 Aug. 1916: 4. “German Flame Attack: Driven Off by the British.” Dublin Evening Mail 16 Oct. 1916: 3. “Ireland’s Claim.” Dublin Evening Mail 21 Oct. 1916: 2. The Man About Town. “Things Seen and Heard.” Evening Herald 6 Oct. 1916: 2. “Mullingar Cinema Theatre.” Westmeath Examiner 7 Oct. 1916: 5. “Picture Plays.” Irish Times 21 Oct. 1916: 9. “Platform and Stage.” Irish Times 28 Oct. 1916: 8. “Provincial.” Weekly Irish Times 28 Oct. 1916: 3. Rambler. “Round and About.” Bioscope 7 Sep. 1916: 869. “Spies Manufactured Wholesale!” Bioscope 19 Oct. 1916: 224. “Union of Women Workers: Meeting of the Dublin Branch: The Work of the Women Patrols.” Irish Times 21 Oct. 1916: 4. This entry was posted in AE, Dr John Knot, Jack Murray, Lady inspectors, Rotunda PIctures by EarlyIrishCinema. Bookmark the permalink.